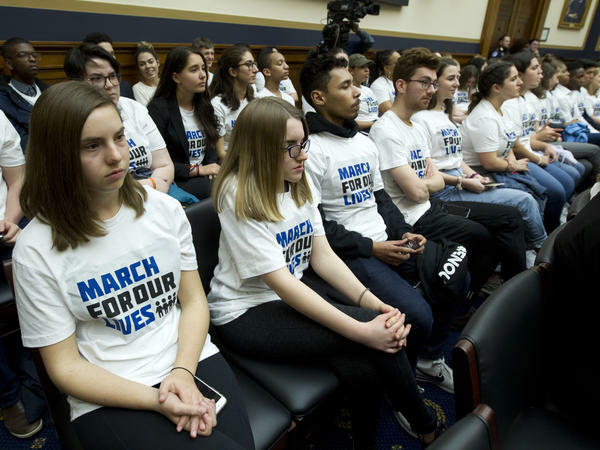 Students in "March For Our Lives" shirts sat in the House Judiciary Committee hearing on gun violence on Feb. 6. Just weeks after a 6-day teacher strike in Los Angeles, educators in Denver are preparing to strike on Monday, barring an agreement with the school district.Union members voted to authorize a strike in January, but put plans on hold while the state's Department of Labor and Employment decided whether to intervene.The Denver Classroom Teachers Association represents more than 5,600 educators in Denver Public Schools. The state agency confirmed Wednesday that, at least for now, it won't get in the middle of the dispute. As Colorado Public Radio's Jenny Brundin reports, the union is pressing for changes to teacher pay, especially when it comes to the current system of pay incentives. In Oakland, Calif., the teachers union announced Monday that educators had voted to authorize a strike, although a date has not yet been set. As Vanessa Rancaño and Matthew Green at KQED report, the Oakland Education Association (which represents nearly 3,000 educators) is asking for salary increases and smaller classes. And not quite a year after teachers in West Virginia went on strike, a controversial education bill has teachers considering another strike. On Wednesday, the House Judiciary Committee heard testimony on gun violence prevention for the first time since Republicans took control of the House in 2011. Student activists packed the hearing. Aalayah Eastmond, a senior at Marjory Stoneman Douglas High School, was among the witnesses who testified. In her opening statement, Eastmond detailed her experiences during the 2018 Parkland, Fla., shooting, and highlighted the burden that gun violence places on communities of color. "Our demand for sensible reforms crosses party lines, geographies, social classes and racial divides," she said. "We are the generation that will end gun violence." Savannah Lindquist, a 24-year-old student at Old Dominion University in Norfolk, Va., testified against gun control legislation. She said she believed her 2016 sexual assault could have been prevented if certain gun restrictions were not in place. The hearing was delayed momentarily after the fathers of two Parkland shooting victims protested comments from Rep. Matt Gaetz, R-Fla., who suggested that a border wall would prevent more deaths than gun control legislation. On Monday, Sen. Lamar Alexander, R-Tenn., outlined his hopes for reauthorizing the Higher Education Act, a wide-ranging law that covers federal financial aid and resources for colleges and universities, among other things. Alexander is chairman of the Senate Committee on Health, Education, Labor and Pensions. At the conservative American Enterprise Institute, Alexander said he wants to simplify the FAFSA — the Free Application for Federal Student Aid, which millions of students fill out each year. Among other things, he proposed cutting down on the number of questions on the application. Alexander also recommended revamping the ways in which students repay federal student loans. And he proposed a new accountability system for colleges, which he described in a New York Times op-ed: "If too many students aren't repaying [their loans]," Alexander wrote, "then that program could lose its ability to enroll students with federal financial aid." The senator said on Monday he hopes to take a version of the legislation to the Senate by summer and make it into law by Christmas of this year. He announced in December that he plans to retire, and won't seek reelection in 2020. "The time has come to pass school choice for American children," President Trump said Tuesday during his State of the Union address. Apart from a mention of "overburdened schools" — which the president connected to "mass illegal immigration" — it was the only reference to education in his speech. Education Secretary Betsy DeVos responded to the State of the Union in a statement reinforcing her support for school choice. As NPR's Anya Kamenetz noted, "The availability of school choices, such as publicly funded charter schools, online charter schools, or vouchers to pay for private school, is largely determined at the state level."